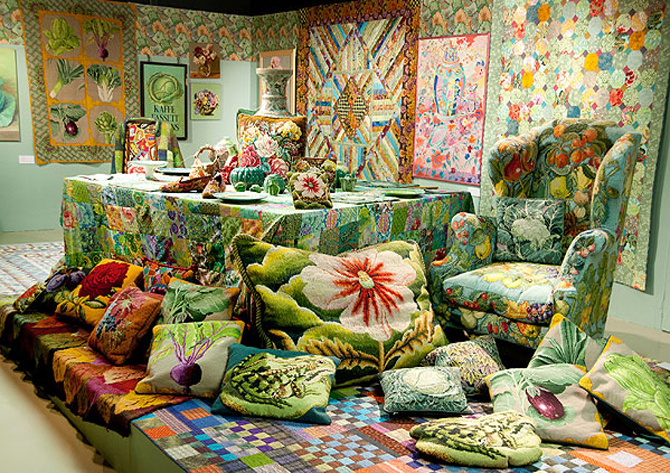 There’s something fabulously old-school hippy about the textile artist Kaffe Fassett and his quilting,needlepoint and knitting style. Maybe it’s his upbringing on the Californian Big Sur coastline where his parents ran a restaurant popular with artists, or his move to the UK in the 60s where he worked with Bill Gibb and settled in Notting Hill, or maybe its his cheerfully bold and upbeat colour combinations. Whatever it is, his gentle, happy vibe is impossible to be miserable around and if you like his work, then nip along to the Fashion and Textile Museum in London where a retrospective of his work is being held. The show has a selection of quilts and knitting, mashed up with some of his early art and recent exquisite needlepoint and embroidery (by far, my favourites). The exhibition is a magnet for the silver haired quilting brigade who spent a lot of time bent low admiring Kaffe’s careful stitch work while I was there. The older quilting ladies I know were brought up in an era where Needlework was on the curriculum at school and sewing was properly considered a skill; where tiny stitches, creative flair and beautiful finishing (the back being as neat as the front) was something to be quietly proud of (no showing off in this age group, obvs, just not done). I think they adore Kaffe’s work because he holds all these values dear too. That and his adventurous approach to colour. 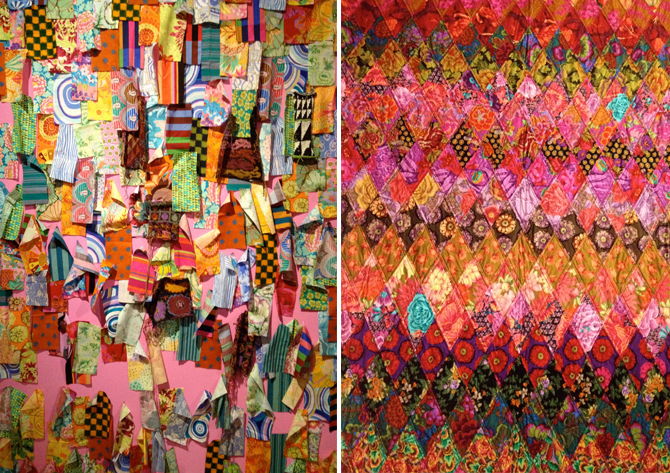 Inspiration board, left and quilt, right, showing Kaffe’s love of a bright hue. 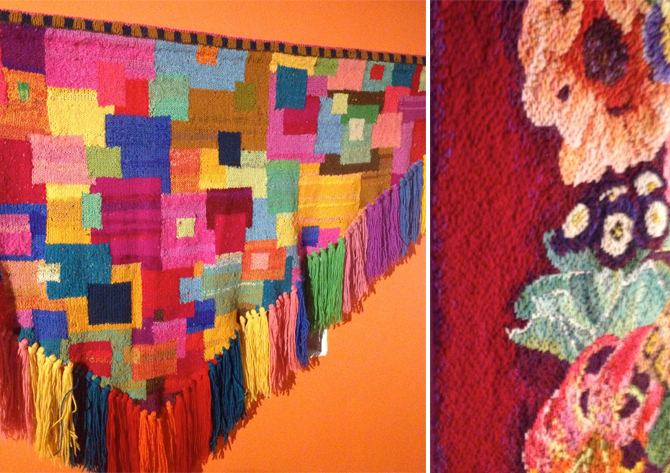 Hippy knitting, there’s always room in the wardrobe for a patchwork knitted shawl…. 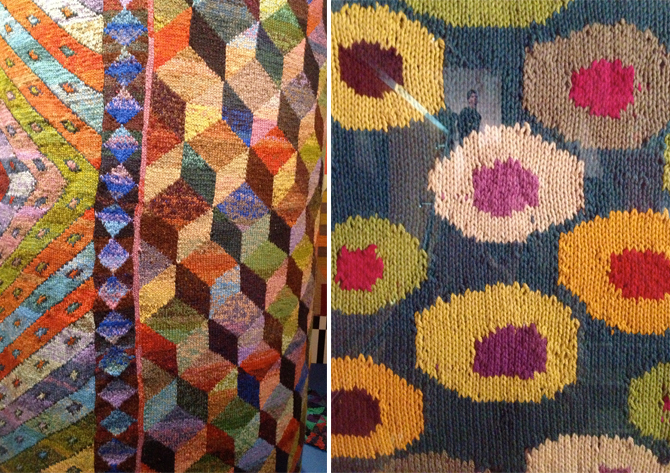 Knitted quilts and patterns, these take me right back to the 70s, when Kaffe worked with the Missoni family to create knitted styles that seemed to be in every copy of Vogue you picked up . The embroideries were gorgeous, the ones I liked were the vegetables, why isn’t there more ruby chard and radish embroidery? Don’t you love the embroidered signatures too? 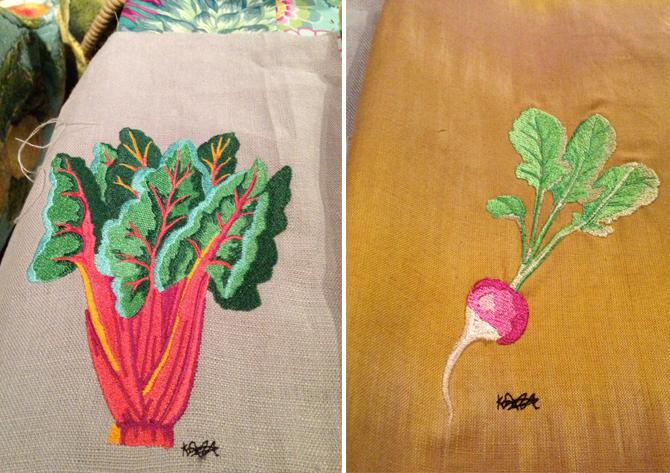 I desperately wanted the vegetable needlepoint cushions, and I might even have to take up needlepoint to have one…. 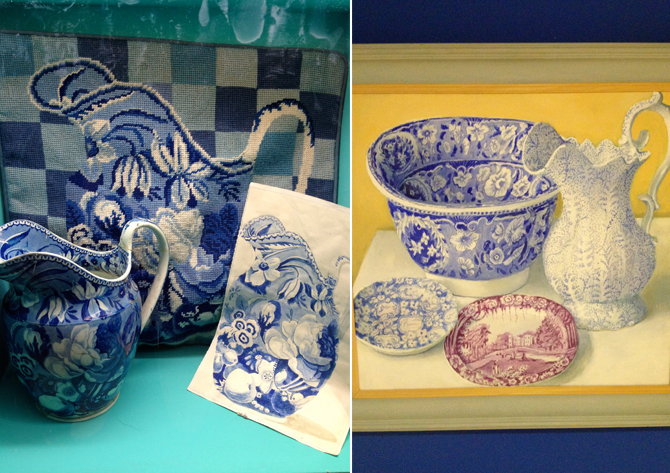 On the way out of the exhibition I fell in love with these 60s & 70s Sindys, which I can’t resist putting in. 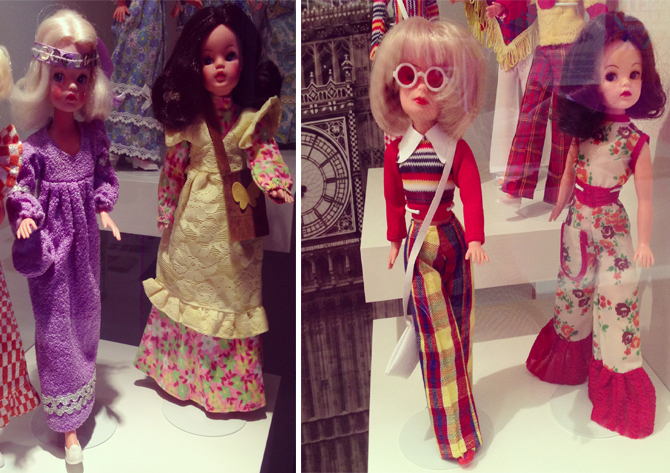 They remind me of making clothes for my dolls when I was little, although I wasn’t this creative. 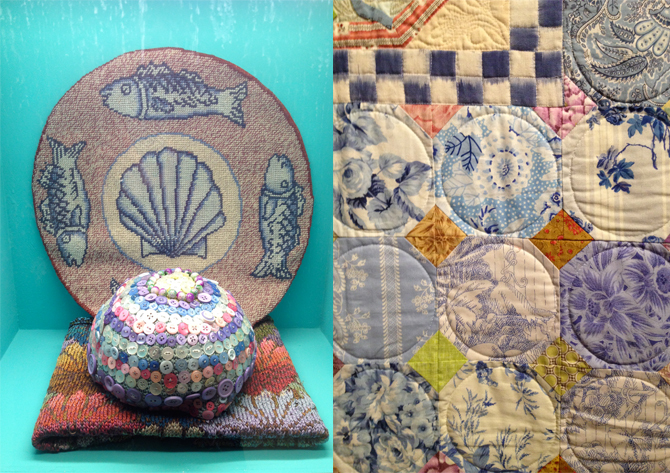 The exhibition is on until June 29th 2013 and there are some great Short Courses where Kaffe is teaching on quilting, if you are interested. Check the museum website for details. Yup, I’ll stick to the needlepoint as well. As a knitter, I’ve seen many of KF’s designs and they’re generally – although splendid and technically brilliant – just a Bit Too Much for me. But those vegetables – gorgeous! They’re great to look at ; might just have to go to the exhibition. If you are keen to do your own,Fine Cell Work do very nice vegetable needlepoint cushion cover kits (and ready made up cushion covers too, if you don’t want to do it yourself).I have the artichoke one.Unfinished, of course. I was so slow I gave up exasperated,but I’m inspired to dig it out again seeing the examples above. Hmmm. 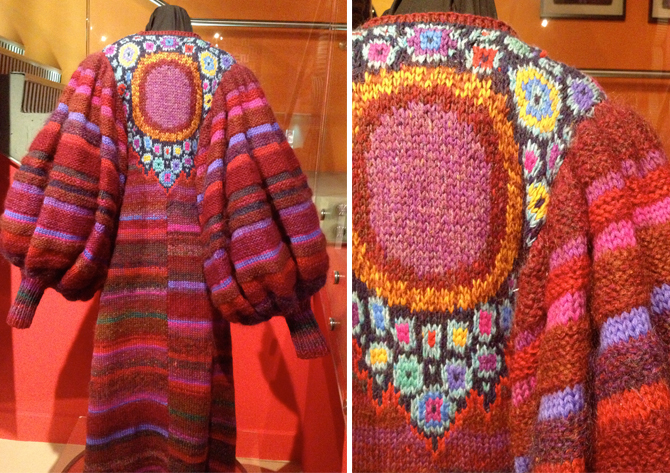 I have never been a hippy and frankly dislike much of the knitting, I don’t think knitting works as textile art, which much of this is. Knitting is for wearing. But the embroidered radishes look good. do you know where I can find a pattern for the needlepointed Frog pillows? I have been looking for years. Did you all listen to this? 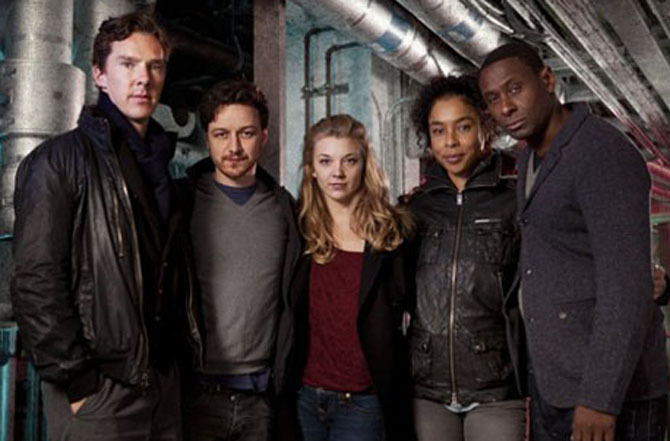 Neverwhere, by Neil Gaiman, which played everyday on Radio 4 and 4plus this week, over almost six hours….